You want to hone your spiritual instincts so that you turn to Christ when anxious thoughts arise. You want to know what Jesus says because when you turn to him in this way his words go deep. You want to be less fearful and anxious and more content and hopeful. You want to be more confident that God’s communication to you in the Bible speaks meaningfully to all the struggles of life. We trust in God not because he delivers us from every fearful situation, but because he alone is King. He will always be with us in fearful situations. He will deliver his people, but at times his deliverance will be more sophisticated than we can understand. God will give you grace when you need it. 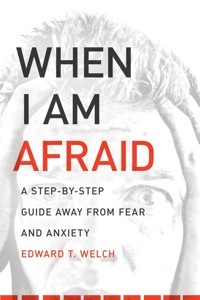 Chapter four summarizes the fear many people have concerning death. Chapter five contains practical counsel for dealing with the fear of man: “Fear of man will prove to be a snare, but whoever trusts in the LORD is kept safe” (Prov. 29:25).